Many people are surprised about Nepal's cultural and scenic diversity. Not only does it feature the highest mountain range on earth, the foothills and lowlands are equally beautiful.Trekking Manaslu offers all of that. Finding a route that lets you experience both of these worlds without meeting too many annoying tourists can be difficult. The Manaslu area in Central Nepal had been opened for tourism relatively recently and has been declared a restricted area. Individual trekkers are not allowed to go there and trekking agencies do not heavily promote the trek. We start north of Gorkha and follow the Buri Gandaki upstream along lush rice fields and pass through small Gurung villages. Rice terraces and yellow rapeseed fields cover the hillsides and wide valleys. Dense forests grow in the deep gorge along the river. Instead of following the standard route to Nupri, we take the narrow exposed trail that goes to Tsum. The valley stretches far into Tibetan territory and offers stunning mountain views. The Ganesh range and Shringi Himal dominate the scenery with their size, though the Buddhist villages with their great stone carvings, chortens and paintings are equally beautiful. During the tough traverse back to the main trail the mountain scenery becomes even more impressive. The gorge slowly changes into an open valley and settlements become larger and more numerous. 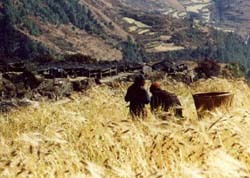 The Tibetan villages are surrounded by wide golden barley fields where people are harvesting. From Lho we have the most stunning views of Manaslu. Full-moon illuminates the pyramid-shaped mountain at night, during sunrise the view of the world's 8th-highest mountain are terrific. Larkya La is the highest point during the trek, 5'220 meters high. 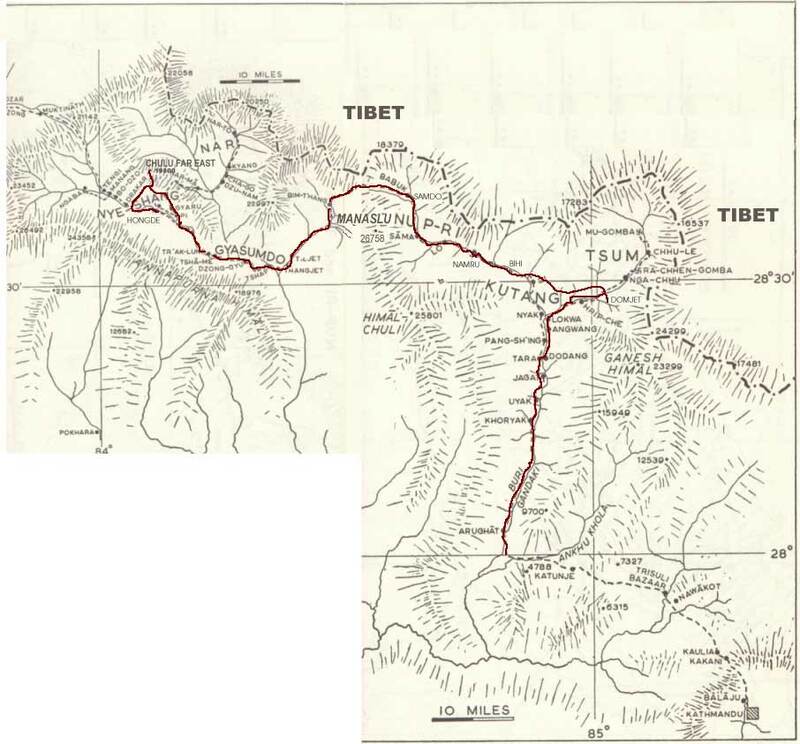 It is not only the passage between the two valleys to the east and west, but also stands between the Himalayan range and the Tibetan plateau. When we join the popular Annapurna Circuit we take the high trail and enjoy the atmosphere in villages and the enchanting scenery. The barren Manang valley features pleasant pine forests that are contrasted by the huge peaks of the Annapurna range. After three weeks of trekking, we attempt to climb Chulu Far East, one of the 'simple' 6'000 meter peaks that can be climbed with limited bureaucracy. Bad weather and cold temperatures turn the climb into a real challenge. 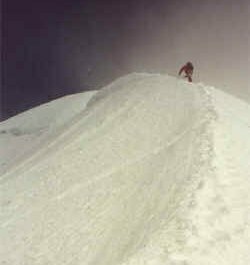 Our effort is rewarded as everbody reaches the summit and gets down safely. The great views during the flight from Hongde to Pokhara evoke memories of the last four weeks - and I wish I were on my next trek already. Please note: I tried to make the description of the following four weeks as accurate and correct as possible. I received the information from locals, our guides or out of books. Undoubtedly, there will still be some mistakes for which I apologize. Acknowledgements: Many, many thanks to Jamie McGuinness (Project Himalaya) for being an entertaining, friendly and very knowledgeable guide. Also thanks to Bharat, Bagman, Tenba, Ang Dami, Tenzi, Tensing and the rest of the crew for making it a carefree and relaxing journey.